Dreamweaver MX is the latest version of the Macromedia Webdesign programmes which combines great design and the ability to link to databases. 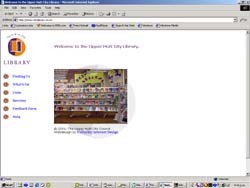 The client wished to have an information site, that would provide information on the library services, as well as a link into the libraries online catalogue. We built a simple multipage site entirely in Macromedia Ultradev for them. As they wished to have control over page content all of the ext elements are delivered from a database, and maintained by the client by online forms. These forms are a little more advanced that the ones used in many of the other site is that it creates HTML tags to include formatting elements.